Don’t have your member number? You can find your University of Washington alumni number (which is also your UWAA member number) on your Columns magazine mailing label or on your UW Alumni Association membership card. Your alumni number may be up to 10 numbers. Older cards often have leading zeros before the number. If you’re asked for a 10 digit ID number, try adding zeros to the front of the number until you reach 10 numbers. For example, alumni number 123456 with zeros added is 0000123456. 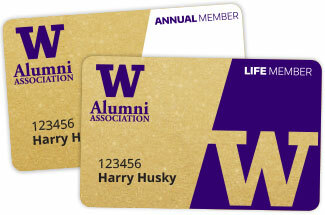 If you can’t locate your member number or are uncertain about your membership status, contact the UWAA at 206-543-0540 or uwalumni@uw.edu for assistance. Don’t miss out on the latest from the UWAA. Please take a moment to update your information. If your member card’s looking a bit tattered, or if you “put it where you’ll be able to find it” and haven’t seen it since, here’s your chance to get a replacement.